Can I import data from one form into another. We have another form that we send back out information to these 200 volunteers about the assignments. Is there any way to import the data collected in the sign up form and then fill out the data we need to fill out and then send it out to the group. I would just like to understand what you are looking to achieve in order to best help you with this, so I would like if you could confirm if I understood you correctly. You have a form where you have already collected some data. You would like to now update the form by going to a different form where you will add a bit more data and have the email notification about all data (on this new form) emailed to the participants? Do let me know if that is correct, or if not, do give us a bit more details in regards to what you are after and we would be happy to assist. Yes. We are wanting to take the form information that has been filled out by volunteers registering and import their name, address, phone, email, from their sign up form and then use that data plus data we HAND ADD OURSELVES, And then when we complete the new form then have it send out their schedule. (We have all this working in past - just not importing name address etc from form they sent in to register - we have printed registration forms and entered that info ourselves for new assignment form. You can merged/combine submissions using the JotForm Combine Submissions App. This answer did not help. We are not wanting to merge data from different forms into an exported file. We simply want to get SIMPLE Names, Address, Email, Phone numbers from a Form we created that 200 people used to register to be a volunteer and then extract that DATA (Name, Address, Email, Phone) and import it into a form that we have created that lists all the jobs we have available with times we need them checked (BY us, By Hand, One at a time) Then we will send out the completed form when we have made their assignments. We would simply like to have all the names, address, emails, phone, already in the forms so all we had to do was hand enter their assignments, not all their information. (The form will generate an email with their assignments at the end.) We have done this before but we had to print up REGISTRATION FORMS and ENTER the entire FORM again. PLEASE this can not be that difficult. I apologize if my suggestion seems to be incomplete previously. 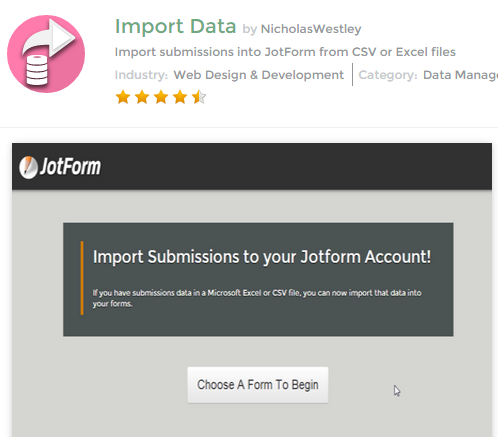 You can import the data (the exported file) to the target form. You can use the Import Data App for such purpose. 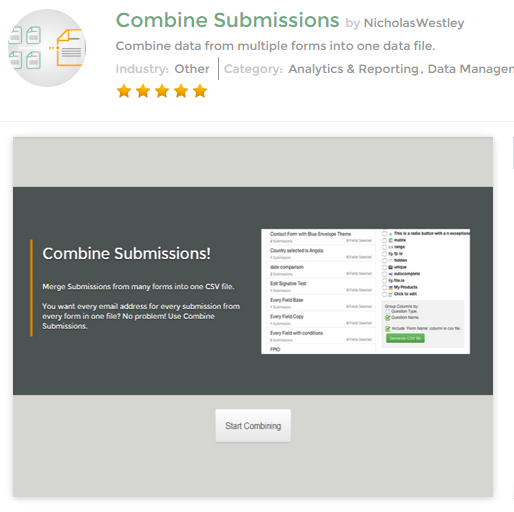 the reason I initially suggested starting from Combine Submission App because, to be able to import the data from the raw file (source file) to the target form submission, they will need to have matching mapped fields. The source file and the target form must have similar field map for the import process to work properly. Please let us know if this still will not work. I understand it can be very frustrating as it requires some understanding on the import process. The difference on the new form is the Name because the source data splits the Full Name to First, Last name (2 fields) I had to change the destination field to 2 field Name also. I recommend you check the submission data to be sure you get where required. Below are your GoFriend Volunteer Assignments. The Festival is almost here and you are officially a "GoFriend." You will be representing the Lord in a very public way. Thank you for attending the GoFriend Training Sessions. We are excited about your volunteering to work in this Festival. Arrive at your assigned jobs a few minutes early and do not leave until someone comes to take your spot. If you do not understand your job or have any questions they will assist you at the GoFriend Check-in Area. I am praying that God, not only uses you to impact lives for His glory, but that you also will be blessed by the unity of our mission, the power of the simple Gospel preached, and by the sheer joy of laboring for the Master. On The Go - Boldly sharing Christ across the street and around the world! <My question and need is how do we get the form to allow us to enter data and when we hit submit, send out their thank you and assignments - like it did before? Thank you. This would only depend on your form email autoresponder. Depending on how it is set you that is how the data will be sent to them, so if I understood you correctly, you want to include not only the message above, but the fields and their data as well and you can see how to do that here: How can I customize the body of the email alert or autoresponder? Once you add all the info that you want into the email body, the data you are after will be sent to them properly. Don't think this answers our question. Last night your tech department was able to import all our Volunteers Names, Email addresses, and phone numbers successfully from their Register form into our Assignments form. We now have a Form full of 200 names, phone, email addresses. The Assignment form also has all the available jobs that we could possibly assign to those who registered. We have decided who is doing which of the jobs and now we want to go into each persons form and select their jobs and then once we hit submit (after entering the new data to the Name, Phone, Email (that was already in the form)) have our letter going out to them (that I sent above) as well as the information (JOB Assignment) that we selected for them. The assignments are in the form already - all of the jobs - but we only want the ones we click on to select for them to go out along with the letter. I am sorry but I am also confused with the new requirements. I suggest creating a new thread about it since I believed this is no longer about the same issue as the original one discussed on this thread which was about importing the data to the form. Please use this link http://www.jotform.com/contact/ to create the new thread. Provide a step by step details on the requirement as much as possible. We will attend to it as soon as we can. This problem is CRITICAL and we really do not have time to reintroduce the issue - our event is in two day s and these people have been needing this info for two days. I'm grateful for help but time is running out for me. I understand your frustration. But actually if you will create a new thread for the issue, it will be easier for other support members to help us also. If you look at this now, every time a support member gets assigned to this ticket they will have to read from the start to be able to understand the issue on this thread. Since the new issue/requirement was not about the original one anymore, the support will be wasting crucial time just by reading the initial discussion. Thank you but the reason it finally was fixed last night and got us to this point was because your team did read it all and was able to see what I was getting at. There is no way at this point to go back and redo all this. We will just have to go back to the original form and hand do everything and completely undo all the good work you all did to get us to this place. So, we will just have to go find another Form solution to help us do this in a faster and smother way. We have enjoyed your program and may continue to use it for simply forms but we will have to look for something that can easily meet our needs. Please check the Title/Question I have set for it if its the correct one. I have put that question because that is how I understand your details.